The safest choice is not to drink any alcohol if you are pregnant or are planning a pregnancy. If a pregnant woman drinks alcohol, the alcohol also enters her baby’s bloodstream. This may lead to physical, learning and behaviour problems for the baby. There is no known safe amount of alcohol during pregnancy. There is no safe kind of alcohol during pregnancy. There is no safe time for alcohol use in pregnancy. The more alcohol a woman drinks, the greater the risks to her unborn baby. If you drank alcohol before you knew you were pregnant, talk to your health care provider or call Motherisk at 1-877-327-4346. Ask for help if you want to quit drinking. Your partner, family members, or friends can be a great source of support. If you have trouble quitting, talk to your health care provider. There are services for pregnant women, and their families, who need help to stop drinking (see the section Learn more about where to get help). Call the Drug and Alcohol Helpline at 1-800-565-8603 for free, confidential information about alcohol and drug addiction services in Ontario. The benefits of breastfeeding outweigh the risks of occasional, light alcohol consumption. Drink alcohol right after breastfeeding, not before breastfeeding. Beer (5%) – 341 mL (12 oz). Wine (12%) – 142 mL (5 oz). Spirits (40%) – 43 mL (1.5 oz). Allow enough time for the alcohol to be eliminated from your body before the next feeding. On average, it takes up to two hours for one drink to be eliminated. Alcohol consumption during the perinatal period includes occasional or moderate consumption, regular consumption, and alcohol-use disorder. However, due to stigma the numbers may, in fact, be higher, since people may be reluctant to report alcohol consumption. While some women are at a higher risk for alcohol consumption during pregnancy, alcohol use is not bound specifically to certain populations. Young women with lower incomes were most likely to have at least five drinks on the same occasion.4,5 This is known as binge drinking20 and places women and babies at greatest risk. Since alcohol is not filtered by the woman’s liver before reaching the placenta, alcohol travels directly across the bloodstream to the fetus.8 When alcohol is consumed during pregnancy, it can affect growth and development of the fetus and can cause adverse effects on the pregnancy and the fetus. The effect of alcohol on the fetus is the same regardless of the type of alcoholic drink being consumed. Table 1: Standard-sized alcoholic beverage. The possible effects of alcohol consumption on a developing fetus can become apparent at different times in a child’s life leading to various physical and developmental problems (e.g., moderate intellectual and behavioural deficits) known as Fetal Alcohol Spectrum Disorder (FASD). Fetal Alcohol Spectrum Disorder (FASD) has only recently been acknowledged in recent revisions of the Diagnostic and Statistical Manual of Mental Disorders – V (DSM – V) It is recognized as a neurodevelopmental disorder associated with prenatal alcohol exposure (ND – PAE). Former understandings of FASD have included many sub-categories within the FASD spectrum. However, current research has eliminated the use of separate categories and acknowledges FASD as one broad spectrum characterized by moderate intellectual and behavioural deficits in addition to confirmed prenatal exposure to alcohol. Please note these are general guidelines and an accurate diagnosis requires a specialist. Short palpebral fissures (i.e., short opening between the eye lids). Smooth or flattened philtrum (i.e., smooth or flattened cleft between upper lip and nose). Thin vermillion border (i.e., thin upper lip border). Small cranial size at birth. Neurological impairments resulting in social and behavioural challenges. Difficulty with social and communication skills. Consuming more than one psychoactive substance (e.g., alcohol used in combination with marijuana, cocaine, opiates, or any other psychoactive substance). The mother’s personal characteristics (e.g., state of health, nutrition, metabolic capacities). The individual sensitivity of the unborn child to the effects of alcohol. The period of alcohol consumption during pregnancy. 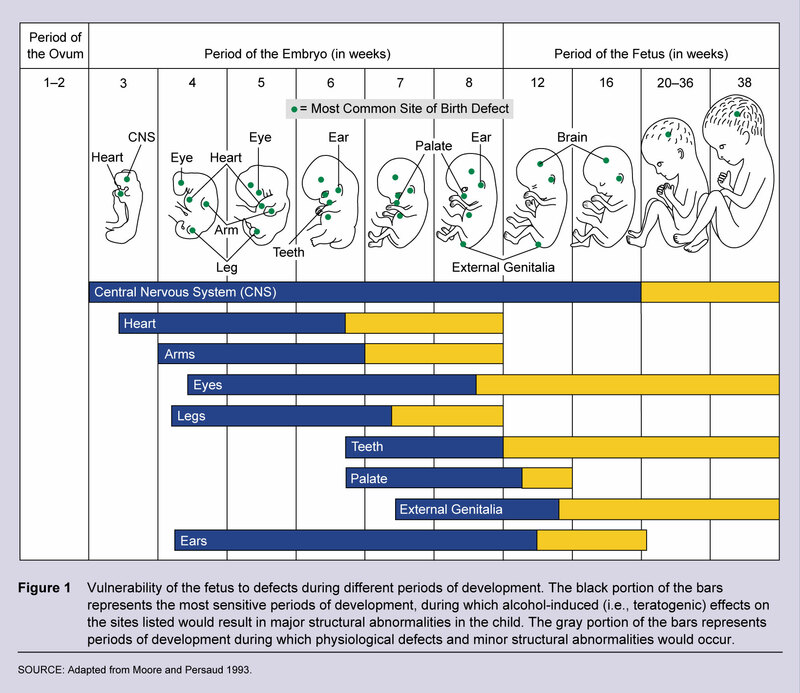 The following table illustrates the periods during which alcohol can cause structural and functional fetal anomalies. 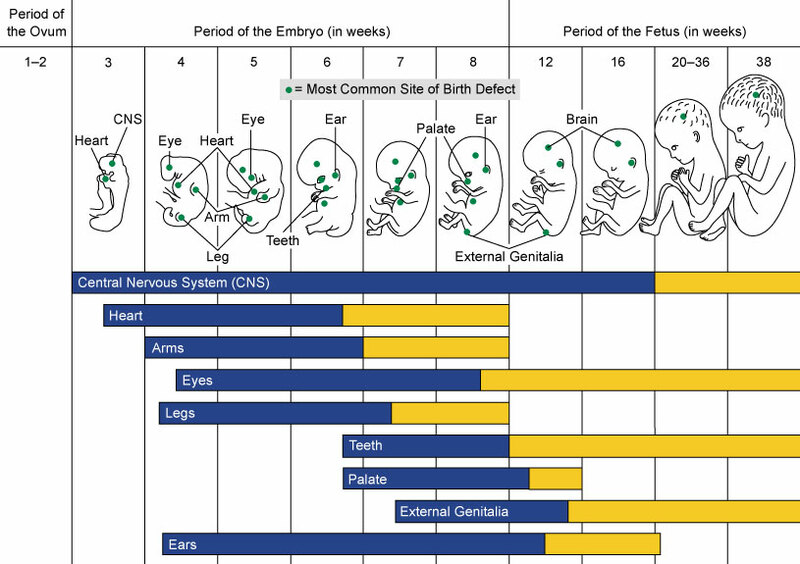 In the table above, the bars represent the periods during which alcohol can cause structural and functional anomalies to the fetus. The dark-blue portion of the bar represents the most-sensitive times when alcohol can cause major structural abnormalities to the child. The yellow portion of the bar represents periods where alcohol causes physiological and minor structural abnormalities. Depending on what point alcohol is consumed during pregnancy, it can affect the development of different organs. It is strongly recommended that women not consume any alcohol while pregnant. It is important to note that alcohol affects the Central Nervous System (i.e., the brain) at all stages of fetal development. Some women will have consumed alcohol in early pregnancy before knowing they were pregnant. They might worry about the effects this consumption could have on their baby’s health. It may be helpful for them to know that consuming alcohol during pregnancy involves possible, not absolute risks for the pregnancy and the unborn child. A majority of women cease or decrease their alcohol consumption when they learn they are pregnant.1,21,22,23 According to the Public Health Agency of Canada, their research shows that alcohol consumption decreases substantially within the three months prior to pregnancy, with a consumption rate of 62.4 percent before pregnancy to a consumption rate of 10.5 percent during pregnancy1. There is also a disparity in who is more likely to discontinue drinking. Of women who live in households at or below the low-income cut-off, 92.5 percent have reported that they do not drink. Yet, 88.2 percent of women who live in a household above the low-income cut-off reported not drinking1. It is common for women and men to consume alcohol at festive events, social occasions, or with a meal. Why listen to the message that advises abstaining from alcohol during pregnancy? Alcohol is a teratogen and can cause birth defects. What about when alcohol is used for cooking? Sometimes recipes (e.g., sauces, meat recipes) call for alcoholic beverages. For pregnant women, the use of alcohol for meal preparation is not a problem because alcohol evaporates when it reaches the boiling point. However, it is suggested to avoid dishes where the alcohol did not undergo a change of state (e.g., desserts that contains alcohol). Although it would be ideal if all women abstained from consuming alcohol during pregnancy, not all women will decide or are capable of doing so. Using an approach that decreases the negative behaviour and the risk is an effective option for some women. Reduce the quantity of alcohol consumed. Space out drinks over a time period. Consequently, when a pregnant woman makes an effort to decrease her alcohol consumption, reinforcing her positive behaviour will give the fetus a chance to develop properly. It should also be recognized that women with alcohol consumption or dependency issues may have other health problems or experience difficult circumstances that require special attention. In any case, judging or stigmatizing women should be avoided and, instead, they should be encouraged to seek services that meet their needs. Mood swings. A lack of pleasure. If a pregnant woman consumes large quantities of alcohol during pregnancy, the baby can also present withdrawal symptoms at birth. In such cases, the baby should undergo a medical examination. It may also be mandatory that child protection services be consulted. Physical symptoms persist three to five days on average, but no longer than one week. Some women report feeling peer pressure to drink alcohol during pregnancy.21 People may discredit their decision to not drink alcohol or encourage them to consume during social activities and festive events. Professionals are encouraged to sensitize pregnant women to this possibility and encourage them to reflect on strategies to address these pressures. Hold social events where there is no alcohol or where it is not central to the event (e.g., meeting in a café or at home instead of a bar). Ensure that non-alcoholic beverages are available and offered to everyone. Support the pregnant woman by reminding her that her abstinence is temporary. Avoid encouraging alcohol consumption and respect the choices made by the pregnant woman. As required, modify their own alcohol consumption to show solidarity for the pregnant woman. The evidence of harm to the fetus when the pregnant woman consumes alcohol is well established. However, the effect of occasional alcohol consumption by the mother on the breastfed infant has not yet been convincingly established. Long term consequences of women with high levels of alcohol use are, as yet unknown.. The advantages of breastfeeding outweigh the risks of occasional alcohol consumption. The Nutrition for Healthy Term Infants (NHTI) recommendations for infants from birth to six months suggests advising breastfeeding mothers of newborns to limit their alcohol intake, but also states that moderate alcohol consumption is compatible with breastfeeding. Mothers who wish to reduce the amount of alcohol their babies are exposed to can choose to abstain from drinking alcohol, or breastfeed their baby before they have an occasional drink. According to popular belief, consuming alcohol (more specifically beer) can help breastfeeding by increasing the quantity of milk produced. However, it has been shown that alcohol negatively affects the baby’s feeding. Among pregnant women who consume alcohol, some do have challenges with consumption cessation, alcohol dependency, or need medical supervision during withdrawal. When a woman has difficulty in ceasing alcohol consumption, has a history of alcohol-use disorder, or needs medical withdrawal management, they should seek professional assistance and referral to specialized programming. Women can refer to the Resources and Links section for information and resources available regarding alcohol and pregnancy. Please note, the information provided here does not replace medical advice, and we strongly urge women and their support networks to speak directly with a medical provider to ensure she receives specialized care. We provide this information to ensure women are aware of the resources available and accessible to them. Please note this is not an exhaustive list of available resources, nor should any of these resources be used in place of seeking professional advice. The resources cited throughout this resource are not necessarily endorsed by the Best Start Resource Centre or the Government of Ontario. When in doubt, professionals should contact the organization responsible for issuing a specific recommendation/practise guideline. Djulus, J. (2007). Consommation d’alcool. In E. Ferreira (Ed. ), Grossesse et allaitement: Guide thérapeutique (1st ed.) (pp. 137-147). Montréal, QC : Éditions du CHU Sainte-Justine. Spézia, F. (2006). Alcohol, tobacco and cannabis: Review ofteratogenicity studies in animals. Gynécologie, Obstétrique & Fertilité, 34, 940-944. Little, B. B., & VanBeveren, T. T. (1996). Placental transfer of selected substances of abuse. Seminars in Perinatology, 20(2), 147-153. Stratton, K. R., Howe, C. J., & Battaglia, F. C. (1996). Fetal alcohol syndrome: Diagnosis, epidemiology, prevention, and treatment. Washington, DC: National Academy Press. Jacobson, S. (1997). Assessing the impact of maternal drinking during and after pregnancy. Alcohol Health and Research World, 21(3), 199-203. The Society of Obstetricians and Gynaecologists of Canada. (2010). Alcohol use and pregnancy consensus clinical guidelines. Journal of Obstetrics and Gynaecology Canada, 32(8, S3), S1-S2. Hayes, M. J., Brown, E., Hofmaster, P. A., Davare, A. A., Parker, K. G., & Raczek, J. A. (2002). Prenatal alcohol intake in a rural, Caucasian clinic. FamilyMedicine-KansasCity, 34(2), 120-125. Peterson, R., & Lafrenière, R. (2002). Toxicomanies et périnatalité: Document de référence pour les intervenants. Saint-Charles-Borromée, QC: Direction de santé publique. Ministère de la Santé et des Services Sociaux. (2009). Unis dans l’action: Programme de formation en dépendances pour les centres de santé et de service sociaux (CSSS). Québec: Author. Abel, E. L. (1984). Pharmacology of alcohol relating to pregnancy and lactation.In E. L. Abel (Ed. ), Fetal alcohol syndrome and fetal alcohol effects (pp. 29-45). New York, NY: Plenum Press. Doré, N., & Le Hénaff, D. (2010). Mieux vivre avec notre enfant de la grossesse à deux ans: Guide pratique pour les mères et les pères. Québec: Institut national de santé publique du Québec. Haastrup, Maija Bruun; Pottegård, Anton; Damkier, Per (2014). Alcohol and Breastfeeding. Basic & Clinical Pharmacology & Toxicology. Vol. 114 Issue 2, p168-173. 6p. DOI: 10.1111/bcpt.12149. Mennella, J. A. (2001). Regulation of milk intake after exposure to alcohol in mothers’ milk. Alcoholism: Clinical and Experimental Research, 25(4), 590-593. Giglia, R., & Binns, C. (2006). Alcohol and lactation: A systematic review. Nutrition & Dietetics, 63(2), 103-116. Cobo, E. (1973). Effect of different doses of ethanol on the milk-ejecting reflex in lactating women. American Journal of Obstetrics and Gynecology, 115(6), 817-821. Mennella, J. and Gerrish, C. J. (1998). Effects of exposure to alcohol in mother’s milk on infant sleep. Pediatrics, 101(5), 21-25. Patra, Y., Bakkar, R., Irving, H., Jaddoe, V. W. V., Malini, S., Rehm, J. (2011). Dose-response relationship between alcohol consumption before and during pregnancy and the risks of low birth weight, preterm birth and small-size-for-gestational age (SGA) – A systematic review and meta-analyses. BJOG 118(12): 1411-1421.